Designation of MT 300 EX Sensors are temperature measurements of devices like motors, controllers, batteries and other model accessories. Presentation of the measured data is realized by the JETIBOX terminal and the wireless information transfer is ensued with aid of the DUPLEX 2,4GHz system. The Duplex System takes advantage of the 2,4GHz-Band for communication which allows not only the transfer of remote control data to the model, but also in the opposite direction to the transmitter. The telemetric data measured during operation are transmitted in real time and the actual state of the data can be depicted on the JETIBOX LCD-display. The MT 300 EX unit records minimum and maximum temperatures of the individual sensors and delivers besides that their actual values. The JETIBOX terminal takes care of parameter adjustments as well as of indications of measured data. 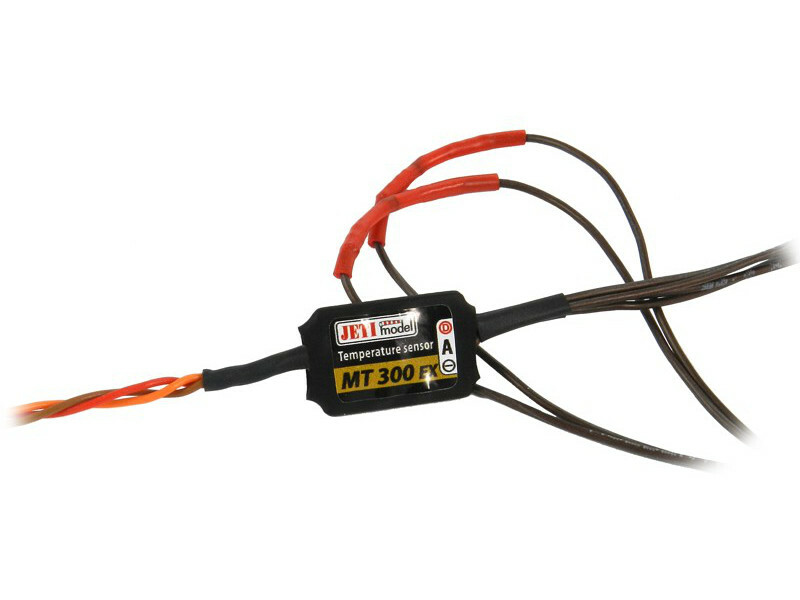 The MT 300 EX device consists of two parts. In the first instance of the MT module itself, which is recording the data measured by temperature sensors connected to the MT module, which on the other hand can be connected to the JETIBOX, to a receiver or to an Expander of the DUPLEX system. Keep an eye on the temperatures of the module and sensors in order not to expose them to temperatures higher than allowable – see technical data table. The MT 300 EX module allows triggering of acoustic alerts by the individual sensors. These alerts can report of temparature limit violations by too high or too low temperatures exceeding adjusted limits. The acoustic signal is generated by the transmitter module DUPLEX Tx which contains a small siren. The signals are differentiated by Morse codes in order to be able to distinguish between the individual types of alerts referring to individual sensors. The acoustic signalling of parameter violations will be generated even if there is no JETIBOX available. With a connected JETIBOX there will be an indication on its display showing which parameter has been violated. If several parameters have been violated at the same time the alert sounds change consecutively as well as the indications in the JETIBOX LCD-display.